Exerpeutic Lxi 10 is a late 2018, brand new release compact indoor exercise bike with a foldable design, the latest smart technology LCD display and the Bluetooth connection capability. The average rating is not very high but only five customers reviewed it so far because of this product being very newly released. You can purchase it with or without the chest belt and the price difference for the belt is 70 dollars at the time of this product review. It is a foldable bike but not less than a decent quality standard size exercise bike by any means. It is sturdy enough to have you pedaling in a standing position and will feel just like cycling uphill. The LXI 10 has a unique patent pending frame design for more stability (patent number D807443). There is a 14-pound flywheel with the magnetic resistance and a 3-piece high-torque crank system to let you cycle smoothly and quietly in a consistent motion. You have 8 levels of magnetic resistance than you can change it through the modern design tension knob in the middle just below the display panel. The multi-grip handles can be held at different positions and feel comfortable thanks to the thick foam cover. 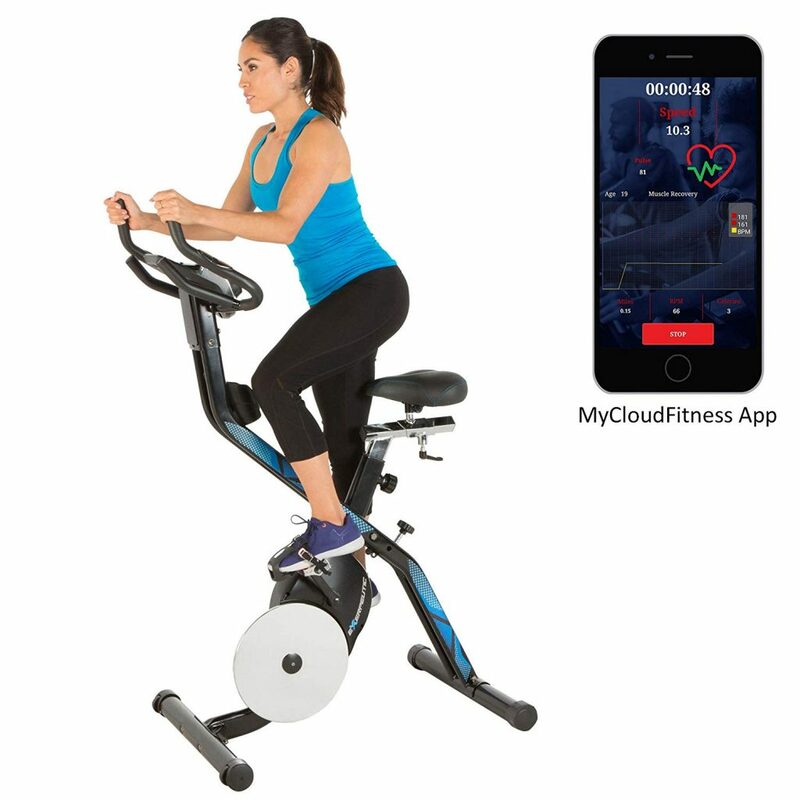 You can find theMyCloudFitness app on both iOS and Android and use it with the Bluetooth capability of this brand new Exerpeutic Bike. You may keep an eye on your important workout stats and stay motivated, and monitor your heart rate with the chest belt hooked up to the MyCloudFitness app. The 3.5-inch LCD display panel shows the usual indicators like your current speed, burned calories, elapsed time, distance traveled, rpm, ODOmeter and pulse rate. You can actually view all of these stats simultaneously on the large display. The large comfy seat with thick padding can be adjusted 4-ways, up and down, forward and backward and has the angle tilt function. People between the heights of 5′ and 6’1″ can exercise on this bike comfortably. It is easy to assemble, weighs 60.2 pounds with a 250 lb. user weight capacity and measures 35.5L x 25.3W x 56.5H inches. You can fold it easily down to the measurements of 26″L x 25.3″W x 66″H and move it on its wheels for storage in a convenient section of your house. This modern bike can be a great choice, also if you don’t have a lot of space in your house. There is a tablet/smart phone holder located just above the display panel for you to check your emails or keep entertained and distracted during your workout. The anti-slip textured aluminum pedals have the toe cages and straps and your feet will stay put during your workout. The chest belt can be used by people with chest sizes between 27.5 and 47.2 inches. The molded foam in the seat has a smooth PU leather upholstery and blue stitching. There won’t be any shaking or tipping during your exercise thanks to the adjustable floor stabilizers. 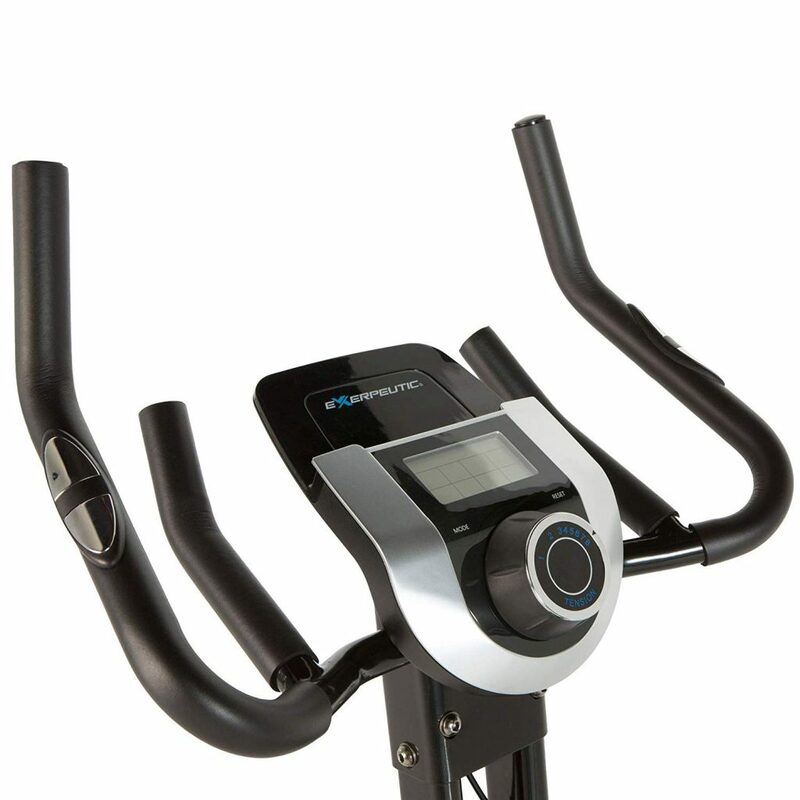 To sum up, it is a very decent and well-made stationary bike with user-friendly functions and a reasonable price.